Fiesta Inn is the perfect Business Class hotel for today's travelers and understands the needs of guests who need to be productive while on the road. Fiesta Inn Silao Puerto Interior is the ideal place to stay for any business traveler who cannot sacrifice comfort or productivity during their time away from the office or home. The hotel's spaces are functional yet friendly, allowing guests to be connected while remaining independent. Today's Fiesta Inn is more than simply a hotel; it is a community of professionals who thrive on success. The hotel is located at kilometer 124 on the Leon-Silao highway at the entrance to the Guanajuato Inland Port, just 5 minutes from Del Bajio International Airport and 10 minutes from the city's major industrial parks. Fiesta Inn features 142 rooms and offers guests access to the 360 Lounge, where they will find the B-On business center and La Isla restaurant. Amenities include 24-hour room service, high-speed wireless Internet, restaurant, fitness center, sun deck and pool, dry-cleaning service, and covered parking. Please note that check-in begins at 3pm. Check out is at 12pm. Express check-out is recommended. Fiesta Inn Silao Puerto Interior offers authentic dining options at La Isla, a 24-hour on-site restaurant that gives guests the flexibility to order a full meal or a quick snack or drink at any time of day or night. Start the day off right with our amazing breakfast buffet, or stop by for lunch and dinner and order from our à la carte menu where you can choose from a variety of healthy yet practical options: salads, pasta, sandwiches, fish and more. Enjoy your meal in a modern ambiance decorated in bright and fresh colors for a pleasant dining experience. Guests are guaranteed to find a comfortable working area in the B-On business center, located in the 360° Lounge, which offers computers and office services along with fast, reliable Internet for staying connected to the business world. Also available are 5 meeting rooms, each of which can accommodate up to 12 people, perfect for hosting video conferences or in-person presentations. 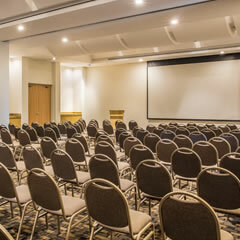 All rooms are equipped with a projector screen, sound system, flip chart, and coffee break service. Fiesta Inn Silao Puerto Interior is the perfect venue for a successful and memorable event. Three fully equipped rooms are available for reservation, each holding up to 65 people. Our trained staff members provide personalized service to ensure that everything goes exactly as planned while allowing you to focus on what you do best. This was the first time for us staying at this Fiesta Inn in Puerto Interior. Usually we stay at the Fiesta Inn in Leon which makes travel to our Mexico facility so much longer. This Fiesta Inn was super nice, the layout was clean. The staff at the front desk spoke to us in English as they knew were visiting Mexico. The breakfast was ok but the breakfast staff was never nice. The beds were comfortable and they always provided two water bottle free of charge, the big bottle was like $34 peso. Across the street on the 2nd floor were 4 restaurants. We ate at them all, not as much selections as in Leon but each one was still very good food and service. Around the corner is a convenience store that sell snacks. Our company booked the hotel but for the price it's very nice hotel. Stay at hotel weekly, bed sheets are not changed and rooms are poorly cleaned and AC don’t cool. I hope my company changes hotels soon. If it were up to me I would stay elsewhere. Customer service is poor. Room service (food) needs to be available 24 hrs. Nothing after 11pm until 6am. I arrived back to hotel after work one night at 10:50 pm and was unable to get dinner. The local restaurant's were closed also. Went to bed hungry that night. The amaenties are modern and the bed is nice and temperature in the room is regulated perfectly. The shower is fully closed in by glass, created a steam rain shower. The staff is so quick and kind. The gym is really nice and has an amazing view. They are extremely nice and professional. The van driver greets you at the airport with great customer service and breakfast is amazing. Very clean and well kept inside and outside. I would definately recommend your stay at this hotel. This room has everything you need for a successful business trip and a relaxing stay, and offers a king bed, closet, telephone, coffeemaker, full bathroom, air conditioning, cable LCD TV, wireless Internet, and an executive work desk and chair. This functional room gives guests a relaxing environment to rest or work as they please. It comes equipped with 2 double beds, a closet, telephone, coffeemaker, wireless Internet, air conditioning, cable LCD TV, full bathroom, and complimentary toiletries. A work desk, chair and lamp are also included so that you can work free from distractions in the comfort of your room. This inviting space was specifically designed to guarantee guests a memorable and productive stay. Guests will love the spaciousness of the suite as they move about the bedroom, living room, dining room, and kitchen area. Furnishings include a king bed as well as a sofa bed, closet, telephone, coffeemaker, microwave, full bathroom, air conditioning, cable LCD TV, wireless Internet, and a work desk.